A guest brought up this question at the shabbos table, and no one had an answer. In D'Varim 8:9 it says "...a land whose stones are iron...". The question this guest asked was: How is it that the chumash refers to iron if this was before the iron age, and therefore iron was useless to the Jews? In Tanach the word Barzel - ברזל appears 44 times. The Torah was given in the year 1313 BCE. Notwithstanding the above, even if iron was useless prior to the iron age, it is likely that it was known as a strong metal, which is what the Torah is referring too. http://www.sciencealert.com/bronze-age-artefacts-have-meteorite-iron -- just saw this article from a scientific journal that says that the iron weapons used during the Bronze Age came from meteorites. That also fits with the language of the verse, which says that the stones are iron. Not the answer you're looking for? 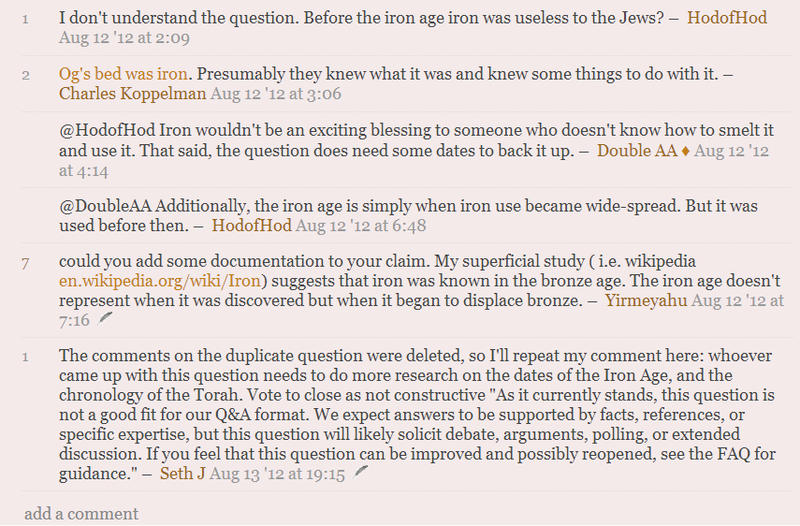 Browse other questions tagged parshanut-torah-comment technology time ekev .